Ballast Water Management Convention and the guidelines for its implementation. 2018 Edition. IA621E | LIBROS NÁUTICOS | Organización Marítima Internacional (OMI / IMO) | Librería Náutica cartamar. Libros Náuticos. Cartas Náuticas | Libreria nautica Cartamar. Libros nauticos. Cartas nauticas. The International Convention for the Control and Management of Ships Ballast Water and Sediments, 2004 (BWM Convention), is concerned with preventing, minimizing and ultimately eliminating the risks to the environment, human health, property and resources arising from the transfer of harmful aquatic organisms and pathogens, through the control and management of ships ballast water and sediments. The BWM Convention also aims to avoid unwanted side-effects from that control and encourages developments in related knowledge and technology. 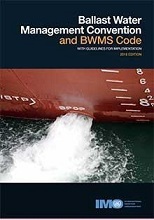 The 2018 consolidated edition reproduces: the updated text of the BWM Convention, including the incorporation of the amendments that have been adopted by the Marine Environment Protection Committee (MEPC) at its 72nd session (9 to 13 April 2018); the text of the Code for Approval of Ballast Water Management Systems (BWMS Code), also adopted by MEPC 72; four Conference resolutions adopted at the International Conference on Ballast Water Management for Ships held at IMOs Headquarters in London from 9 to 13 February 2004; the up-to-date set of Guidelines for the uniform implementation of the Convention developed and adopted by MEPC, including revised versions adopted by MEPC up to its 71st session (3 to 7 July 2017); and other guidelines related to the implementation of the Convention. This publication aims to provide an easy and comprehensive reference to the up-to-date provisions and Unified Interpretations of the Articles and Annex of the BWM Convention.